A small Mine owned by Marvin Symes. It shows unusual and beautifully distinctive Deep Green Coloring with Black/Brown Matrix webbing. This mine has seen little activity over the years. This is mostly seam and vein material from what I have seen .Is a nice light color with light brown webbing. Almost looks like the dry creek material. Is Hard and takes a great shine. Another of those hard to find and rare stones. 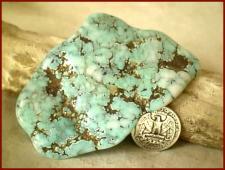 I have a stash of this turquoise and hope to make some wonderful silver jewelry and gold jewelry. A very small quantity and a fair quality of McGinnis was discovered in 1930 in Nevada. This mine was one of the better known smaller turquoise mines. I have seen some really neat McGinnis lately. A variety of colors. 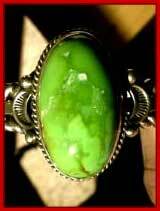 You can find this in many varieties of turquoise jewelry and old pawn jewelry. This is an old mine and puts out some of the best colors with tight black or brown spiderweb matrix. 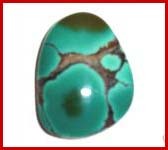 Although This turquoise has not been marketed much, it is some of the finest green turquoise we have seen. This mine also produce a very rare form of turquoise, Psuedomorph Clam Shells, these are prehistoric clam shells that have had parts of the dead clam replaced with turquoise. These clams are very rare and valuable. 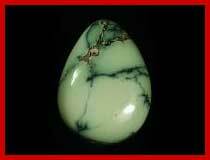 Look for this stone in highend turquoise jewelry. These claims are owned by Nevada Turquoise Company. The mine has been pillaged by an unknown person who burried the pits and has left it un mineable at this time. The Monte Cristo mine produced a medium blue or blue-green turquoise which has a light to medium brown matrix. A lot of This material needs to be stabilized. More info to be posted at a later date. Montezuma is another of the small Nevada Turquoise mines. Beautiful green and Blue/green turquoise, only small production. Very nice material! Solid, not much matrix, cuts well. A lot of This material needs to be stabilized, but what doesn't need to be stabilized is gorgeous stuff. The New Lander turquoise is very beautiful! Most of This material looks like Lander Blue only it is green, orange, and yellow, mostly green. It apears to be varasite or chalcociderite rather then turquoise but is marketed as turquoise, it has the beautiful clarity and depth of varascite It is being mine across the valley from the Old Lander Blue Mine. The Nevada Blue Mine produces a beautiful blue turquoise similar to persian blue turquoise, ranging from light blue to dark blue. A lot of This material is straight blue or has little matrix. Some high-grade has a fine spiderweb matrix with dark brown colored matrix. The No. 8 turquoise mine in Carlin, Nevada was first mined in 1929 until its depletion. In its prime, No. 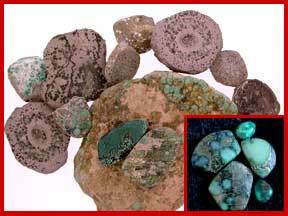 8 produced some of the largest nuggets of turquoise found. A spider web matrix of colors ranging from golden brown to black set off the unique bright powder blue background of the stone. High grade No. 8 is deep blue in color and is very rare. No. 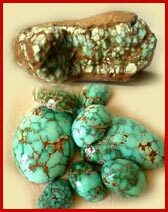 8 turquoise has been a very valuable acquisition, rumors of new stashes of great quantity threaten the value from a collectors standpoint, if they prove to be true, of coarse the high-grade will always be very valuable. One of Cutler Edgars. 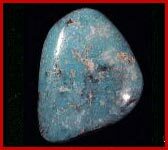 This turquoise has recently seen a rebirth in turquoise jewelry production. Northern Lights Turquoise mine produced a real nice medium to dark blue turquoise, some had a red spiderweb matrix, some was a dark, almost "military green" color. This mine is located beside the Carico mine about 80 miles north of Austin , in Lander County, Nevada. Lander County has produced some of the best turquiose in the world. This mine is currently owned by Brian mason from crescent valley, and is currently not being mine. Orvil Jack a who was NOT a one armed miner discovered and developed the mine in northern Nevada that produces the turquoise that bears his name. The mining claims where the deposit is located is called the Blue Ridge in Crescent Valley. Original Orvil only sought out blue turquoise, and at This time, I have heard, he would have his helpers simply discard the greed turquoise in search of blue. The rare yellow-green color of the turquoise (Faustite and Varasite) comes from the zinc content. Mr. Jack is now deceased, but his daughter Grace continues to manage the mine. Only a small amount is now being produced, and the turquoise is considered very collectible due to its rare color and scarcity. The Pauite turquoise mine shares a mountain with the Godber/Burnham/Drycreek mine in central Nevada. While claims at the Pauite site date back to 1974, the mine has been actively productive since 1992. The Pauite mine produces limited quantities of high-grade spider-web turquoise. It has a wide graduation of blue tone, from light to dark, with web or matrix in colors of black, orange, brown, and red. It is hard turquoise and some of the finest we have ever seen. Recently the miner (Tony Cotner) let us view some samples of his AAA+ high-grade, and it was breath taking, I would have to say it rivals Lander Blue. Papoose is one of Nevada's well-known smaller Turquoise mines. This mine is located in the western part of Nevada and produced a small amount of beautiful blue green turquoise with a brownish matrix. 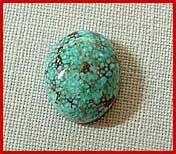 This turquoise has been featured in many old pawn turquoise jewelry pieces. Wonderful gold and silver jewelry can be made with Pixie, we especially like it when combine with natural purple sugilite. The Pilot Mountain mine is located in northern Nevada. It is still producing and different claims are worked by the Ottesons, Durango Silver Company and Nevada Turquoise Company. The stone is highly admired for its deep blue-green colors. 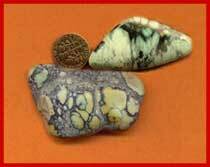 In addition, it can show light blue to dark green colors on the same stone. This graduation in color is unusual and makes the turquoise very collectible. The matrix is black to golden brown. Pilot Mountain is a hard stone and takes a good polish. Most Pilot Mountain comes in thin viens as shown on the cab to the left, but we have recently discovered some thick vein. I am possitive you will find this in a ton of old pawn Turquoise jewelry. This mine produced some awesome Variscite. as well as turquoise. 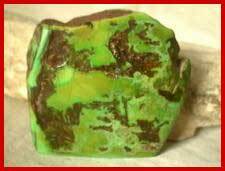 The Variscite. from This mine is primarily in vein formation which is located in an area shared by the Milkyway Damaile Mine. The Variscite. when cut shows a nice strong black matrix and the green is a nice olive to dark green. But the green will run into other shades and even turn a yellow. The Turquoise however, is a medium blue in brown mud. 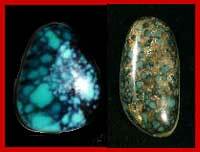 Most of the turquoise comes in nugget or nodule form and comes from the top of the mountain the mine is on. Originally This mine was known for the turquoise not the Varascite.